Sulfated Castor Oil, Glycerin, Picea Excelsa Leaf Oil, Alcohol, Limonene*, Simmondsia Chinensis (Jojoba) Seed Oil, Arachis Hypogaea (Peanut) Oil, Fragrance (Parfum)*, Geraniol*, Linalool*, Chlorophyllin-Copper Complex (CI 75810). Great product, but it needs to be available in a larger bottle. The instructions state to add several capfuls to the bath, but after adding just two, the tiny 30 ml bottle is nearly half empty. :( I felt that adding 3-4 capfuls would have made the perfect bath for me, but I couldn't do so as I didn't want to run out straight away. Shame, as the scent and sensation created with this essence are both beautiful. I do think the product would benefit from being sold in larger bottles nonetheless. It is a thick liquid and seems like it would run out pretty fast. Sell it in a bigger bottle? I absolutely love this bath essence - the smell is incredible and so relaxing. Great for winter revitalisation. Would be great if you would consider selling in bigger bottle - I keep running out. This product is wonderful when your full of cold. It warms you up and it also decongests you. 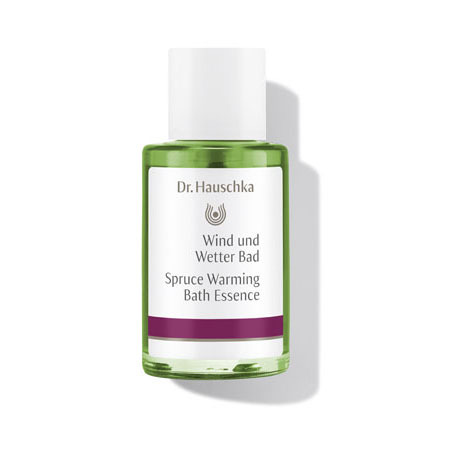 This is one of my favourite Dr Hauschka & I look forward to buying it every winter. I love the fragrance & lying in the bath dreaming of being in the forest. Although this is for the bath, I use it after my shower, do not really take baths. I would apply to a slightly dampen washcloth/flannel and wipe my skin dry with the oil. I would rinse my flannel/washcloth out with hot water and this creates a fragrance which would linger in the shower. wish it comes in a larger bottle. Excellent oil. I use this in my daily cleanse routine. Inhaling the sage is so comforting I relax instantly. A wonderful way to start and finish each day. One of the benefits of the colder months is the chance to relax in a bath made with this gorgeous essence. The scent and oils relax and invigorate. My only suggestion for improvement is to provide bigger bottles! Fully recommend this- sooo relaxing, warming and invigorating. Especially good on a flannel and face to clear a sore head or a cold. Nothing better on a cold night that having a bath using this bath essence. Amazing aroma that relaxes you. Also great for clearing your head after a busy day. A deliciously indulgent bath essence for chilly nights. Most stimulating!! I love this oil, the scent is herbal and warming which boosts you up. I use it all year, although I can see why it is marketed for the colder months. I hope Dr Hauschka start to sell it in a bigger bottle. Nice treat but expensive. Felt restorative mid winter, warmed me up after a long cold day. I adore the product and all things rose but the Norway Spruce Bath definitely needs to be in a far larger bottle 500ml or litre perfect! ?? A small bowl containing Spruce Warming Bath Essence pleasantly fragrances the air in rooms, particularly in winter.